“Fellow historians will be shocked, dismayed, and perhaps incredulous–I am daring to suggest that the Curse did not first manifest itself on June 4, 1905, which was the disastrous morning of Annabel Slade’s wedding, and generally acknowledged to be the initial public manifestation of the Curse, but rather earlier, in the late winter of the year, on the eve of Ash Wednesday in early March”. In the winter of 1905, Princeton was hit by strange events, deaths and people swore they saw ghosts and vampires walking around in the streets. 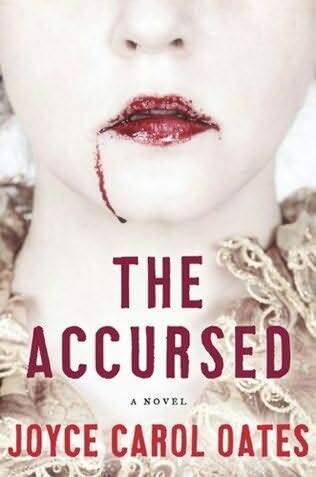 For the prominent Slade family, the curse seems to evolve around them, and when the beautiful Annabel runs from the altar on her wedding day with another man, the scandal is complete. The book description tricked me into buying this and reading it for Easter. Sadly, it didn’t scare me at all, yet I enjoyed reading about the happenings in Princeton. I really enjoyed all the famous persons in this book, from Woodrow Wilson to Upton Sinclair and Jack London. Although if Jack is portrayed correctly, I certainly lost a lot of respect for him. It was also interesting to read about the feminist and socialist movements and the way upper class families reacted to these trends. My favourite character was Wilhelmina Burr(? ), and I was disappointed when she sort of disappeared off to art school and thus out of the story. But I found the historian’s narrative really annoying, and confusing. And as I already said, I wish it had been more thrilling, although I really enjoyed those supernatural parts as well. Sadly I just wished I would reach the end, so I skimmed the last chapters which is probably the reason why I feel that I missed out on the whole explanation of the curse. Joyce Carol Oates has done a great job with the setting of this book, and I simply forgot at times that this just came out and wasn’t a classic. This is the fifth book in the Gothic series, and I will definitely read the others, as well as explore more of Joyce Carol Oates’ books.